BEAT PLASTIC POLLUTION - Tackling ocean plastic is a United Nations agenda for sustainable use of the oceans and conservation of marine life under SDG14. Each World Environment Day is organized around a theme that focuses attention on a particularly pressing environmental concern. 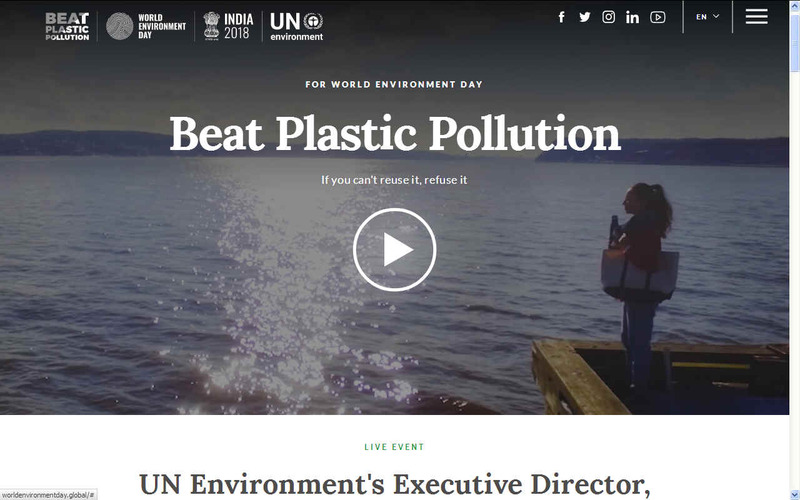 The theme for 2018, “Beat Plastic Pollution,” is a call to action for all of us to come together to combat one of the great environmental challenges of our time. The theme invites us all to consider how we can make changes in our everyday lives to reduce the heavy burden of plastic pollution on our natural places, our wildlife – and our own health. While plastic has many valuable uses, we have become over-reliant on single-use or disposable plastic – with severe environmental consequences. The World Environment Day is the single largest celebration of our environment each year. Since it began in 1974, it has grown to become a global platform for public outreach that is widely celebrated across the globe. While plastic has many valuable uses, we have become over reliant on single-use or disposable plastic – with severe environmental consequences. Around the world, 1 million plastic drinking bottles are purchased every minute. Every year we use up to 5 trillion disposable plastic bags. In total, 50 per cent of the plastic we use is single use. New Delhi – India went big in their commitment to Beat Plastic Pollution today, with an announcement to eliminate all single-use plastic in the country by 2022. This unprecedented ambitious move against disposable plastic will drastically stem the flow of plastics from 1.3 billion people and business in the fasted growing economy in the world. 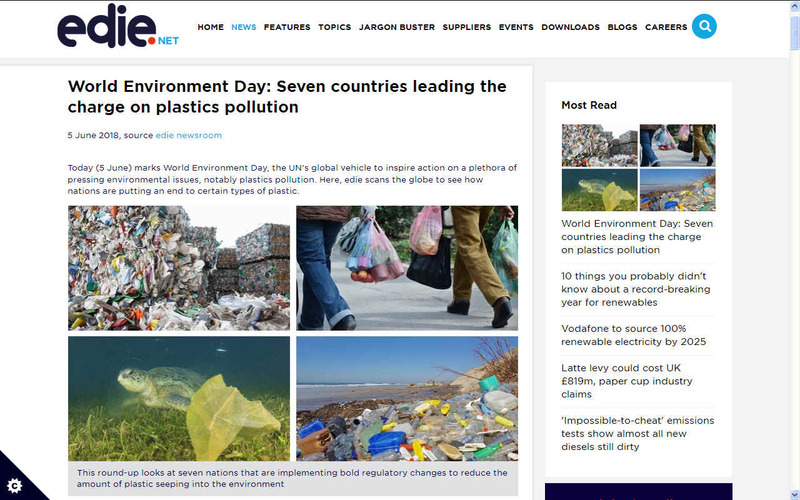 Rarely has a sustainability issue captured public, corporate and government attention as rapidly as the mounting concerns surrounding plastics, making the topic a fitting theme for this year's World Environment Day. Last year’s Blue Planet 2 series, compounded by a damning Ellen MacArthur report predicting there could be more plastic than fish in the ocean (by weight) by 2050, has brought the topic under fresh scrutiny in the UK, with a string of big-name companies across the retail, hospitality and leisure and food and drink sectors having recently announced plans to phase out single-use plastics in their operations. The topic has even impacted on government policy, with the 25-Year Environment Plan outlining a 2042 ban on all “avoidable” plastic waste. The move follows on from the January ban on the manufacture of certain products containing plastic microbeads and the introduction of charges for plastic bags, which has already reduced single-use plastic bags given out by major retailers by 85%. With this in mind, the UK could arguably be considered one of the nations leading the growing war on plastics. Here, edie looks at seven other nations which are at the forefront of plastic action. In a bid to cut down on the two billion single-use plastic bags which are distributed across the world each minute, Chile recently approved a bill that will see plastic bags banned across the country, making it the first South American nation to do so. While the original bill was meant to only cover the Patagonian region in the south of the country, it was later extended to the entire nation, and will come into force next May. Bin liners will be excluded from the ban, while small businesses will have until May 2020 to eliminate plastic bags. The Association of Plastic Manufacturers (Asiplas) estimates that Chile uses more than 3.4 billion plastic bags a year – the equivalent of each resident using more than 200 annually. The ban will see these bags replaced with sustainable alternatives such as paper, cotton or sugarcane variants. Announcing the bill, which passed by 134 votes to one abstention, Chilean President Sebastián Piñera said: “We have taken a fundamental step to take better care of Chile and the planet. Today, we are more prepared to leave a better planet to our children, grandchildren and the generations to come”. Set in August 2017, Kenya’s plastic bag ban is widely regarded as the strictest in the world, anyone producing, selling – or even just carrying – a plastic bag facing a up to four years’ imprisonment or fines of $40,000. The only exemption is for manufacturers who use polythene to wrap products. 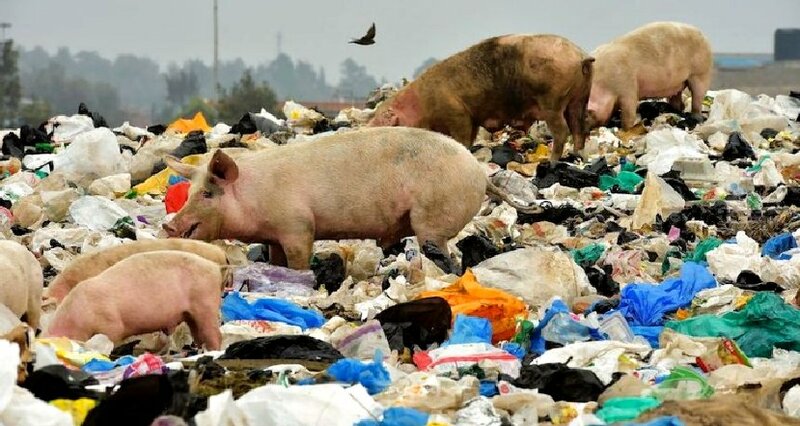 The ban was set after Kenyans were found to be using 24 million plastic bags each month, with the United Nations' Environment Programme finding that cows slaughtered in Nairobi regularly had up to 20 bags in their stomachs, sparking fears over plastic contamination in the food chain. Eight months on from the ban, residents in shanty towns told The Guardian they had seen an immediate decline in the number of bags littering their neighbourhood – particularly from a convenience known as “flying toilets”, where residents defecate in a plastic bag, tie it up and then throw it on to the tin roofs. In Germany, a deposit return scheme was introduced in 2003, with customers paying a 25 cent deposit on every bottle of soft or alcoholic drink excluding milk, baby products and medical beverages. The move has seen almost 99% of the country’s plastic bottles returned for recycling and, since the introduction of the scheme, an estimated 1.2 billion containers have been diverted from landfill. Glass bottles are also subject to the scheme and typically have a deposit of between 8 and 15 cents added to their cost. Once they are collected, they are typically sent back to manufacturers for cleaning and refilling. Norway is another nation to have seen success with a deposit return scheme, with 95% of the nation’s plastic bottles having been returned for recycling since its introduction in 2014. Since implementing the scheme, the Norwegian government has set up more than 3,500 reverse vending machines and 11,500 registered collection points across the nation to encourage residents to recycle. This improvement in recycling infrastructure was paid for by packaging manufacturers, with the government taxing firms both for producing single-use packaging and for covering the cost of waste collection and recycling. Analysis of the system in Norway by the Campaign to Protect Rural England (CPRE) - which has lobbied for a UK-based deposit scheme for a decade - found that businesses will not suffer losses from such a system run in the UK. Consumers will only suffer a financial loss if they fail to return the bottle or can, encouraging strong take-up of the system. Although part of the UK, Central Government could do well to look north of the border for inspiration. In the past few months, Scotland has unveiled plans to become the first UK country to ban the sale and manufacture of plastic-stemmed cotton buds and has opened the nation’s first plastic-free supermarket. Looking to the future, the Scottish Government will introduce a national deposit return scheme for drinks containers by 2020 in a move that First Minister Nicola Sturgeon estimates will save £5m a year from reduced kerbside litter and push plastic bottle recycling rates above 90%. It could also introduce a ban on plastic straws as early as next year, it has been reported, while the UK-wide ban on straws, stirrers and plastic cotton buds will likely still be under consultation. In 2016, France became the first country in the world to ban the manufacture and sale of single-use plastic cups, cutlery, plates and takeaway food boxes. The law requires all disposable tableware to be made from 50% bio-sourced materials that can be composted at home by January 2020, rising to 60% by 2025. 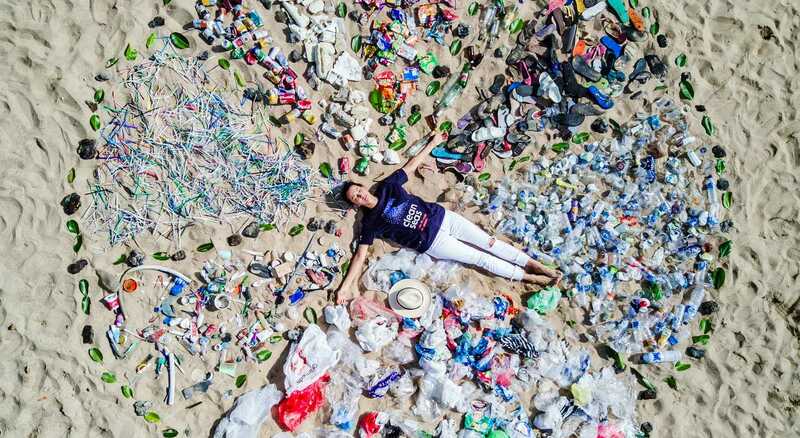 The legislation was passed after statistics from the French Association of Health and Environment revealed that only 1% of the 4.73 billion single-use plastic cups thrown away each year in France were recycled. France also banned shops from distributing plastic bags in 2016 in a bid to reduce the 17 billion which are used nationwide annually. Of those 17 billion bags, eight billion were estimated to be littered annually before the ban. Most shops now offer either paper bags or reusable plastic alternatives, at a cost of a few cents each, and encourage customers to reuse their bags. Current recycling rates for plastics in Canada are stalling at 11%, which might make the nation an unlikely candidate for this list. But at this year’s G7 summit in Quebec, the Canadian Government is widely expected to announce a target of an 85% plastic recycling rate by 2025, and a requirement that all single-use plastics should be made up of at least 75% recycled material. The targets will form part of an anti-plastics charter, which Canadian Prime Minister Justin Trudeau is keen for all G7 countries to sign. Other items on the list are legislation to require producers of plastics to pay to collect and recycle the material they produce, a ban on Styrofoam and a regulation to ban any hard-to-recycle or toxic plastics and additives. Canada’s Minister of Environment and Climate Change, Catherine McKenna, previously dubbed the document a “zero-plastics-waste charter” and claimed it would go further than the EU’s Plastics Strategy. The theme for 2017 was 'Connecting People to Nature – in the city and on the land, from the poles to the equator'. The host nation was Canada. The 2016 WED was organized under the theme "Go wild for life". This edition of the WED aims to reduce and prevent the illegal trade in wildlife. Angola was chosen as the host country of the 2016 WED during the COP21 in Paris. 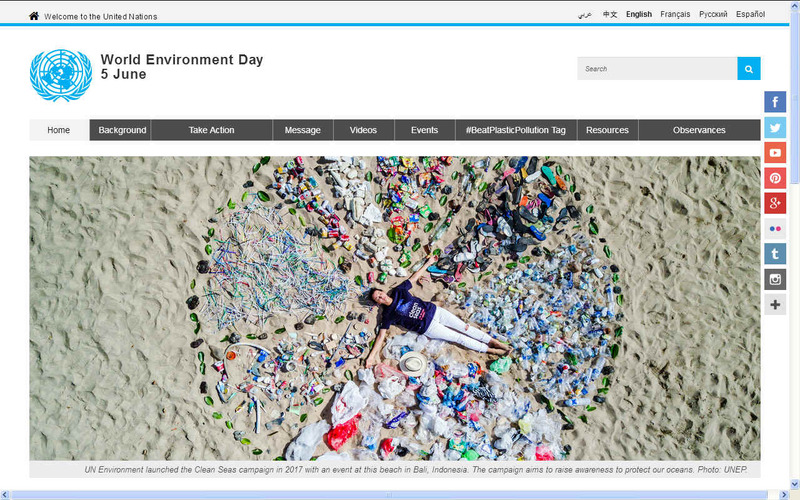 The Slogan of the 2015 edition of the World Environment Day is "Seven Billion Dreams. One Planet. Consume with Care". The slogan was picked through a voting process on social media. In Saudi Arabia, 15 women recycled 2000 plastic bags to crochet a mural in support of the WED 2015. In India, Narendra Modi planted a Kadamb sapling to celebrate the World Environment Day and raise awareness for Environment. Italy is the host country of the 43rd edition of the WED. The celebrations took place as part of Milan Expo around the theme: Feeding the Planet - Energy for Life. The Theme of the 2014 WED is : International Year of Small Islands Developing States (SIDS). By choosing this Theme the UN General Assembly aimed to highlight the development Challenges and successes of the SIDS. In 2014, the World Environment Day focused on global warming and its impact on ocean levels. 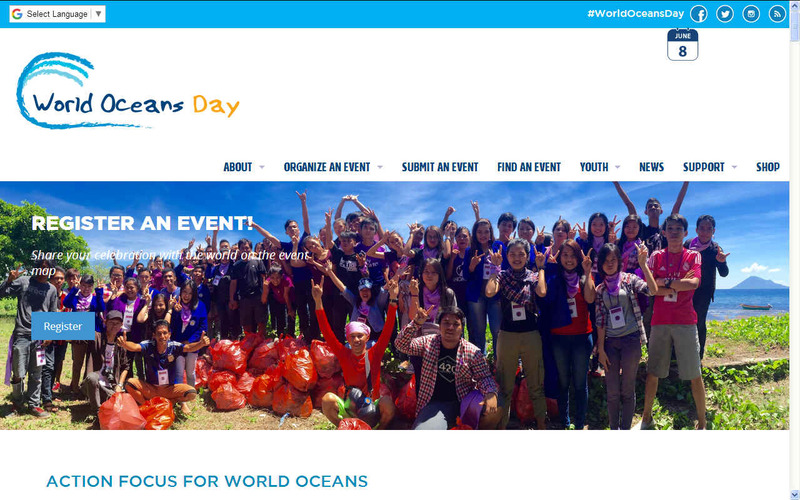 The Slogan of the WED 2014 is "Raise your voice not the sea level", as Barbados hosted the global celebrations of the 42nd edition of the World Environment Day. The UN Environement Programme named actor Ian Somerhalder as the official Goodwill ambassador of the WED 2014. The 2013 theme for World Environment Day was Think.Eat.Save. The campaign addressed the huge annual wastage and losses in food, which, if conserved, would release a large quantity of food as well as reduce the overall carbon footprint. The campaign aimed to bring about awareness in countries with lifestyles resulting in food wastage. It also aimed to empower people to make informed choices about the food they eat so as to reduce the overall ecological impact due to the worldwide production of food.The host country for the year's celebrations was Mongolia. The theme for the 2012 World Environment Day was Green Economy: Does it include you? The theme aimed to invite people to examine their activities and lifestyle and see how the concept of a "Green Economy" fits into it. The host country for the year's celebrations was Brazil. The theme for 2011 was Forests-Nature At Your Service. Thousands of activities were organized worldwide, with beach clean-ups, concerts, exhibits, film festivals, community events and much more. 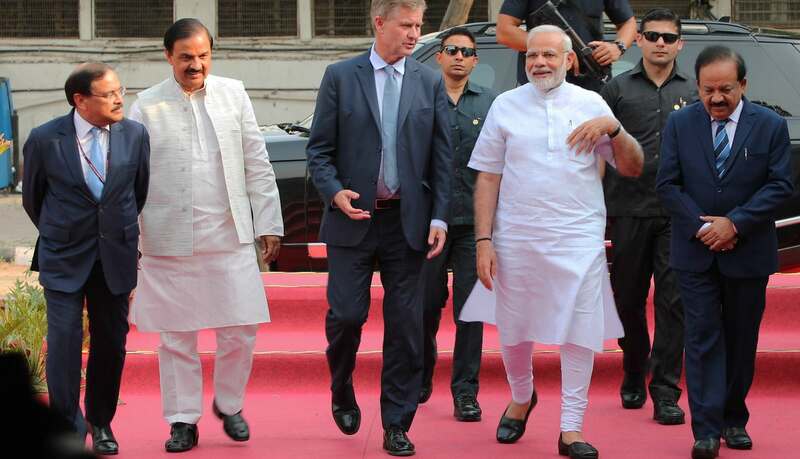 That year's global host, India, is a country of wide biodiversity. 'Many Species. One Planet. One Future', was the theme of 2010. It celebrated the diversity of life on Earth as part of the 2010 International Year of Biodiversity. It was hosted in Rwanda. Thousands of activities were organized worldwide, with beach clean-ups, concerts, exhibits, film festivals, community events and much more. Each continent (except Antarctica) had a "regional host city", the U.N. chose Pittsburgh, Pennsylvania as the host for all North. The theme for WED 2009 was 'Your Planet Needs You – UNite to Combat Climate Change', and Michael Jackson's 'Earth Song' was declared 'World Environment Day Song'. It was hosted in Mexico. The host for World Environment Day 2008 was New Zealand, with the main international celebrations scheduled for Wellington. The slogan for 2008 was "CO2, Kick the Habit! Towards a Low Carbon Economy." New Zealand was one of the first countries to pledge to achieve carbon neutrality, and will also focus on forest management as a tool for reducing greenhouse gases. The Chicago Botanic Garden served as the North American host for World Environment Day on 5 June 2008. The topic for World Environment Day for 2007 was "Melting Ice – a Hot Topic?" During International Polar Year, WED 2007 focused on the effects that climate change is having on polar ecosystems and communities, on other ice- and snow-covered areas of the world, and the resulting global impacts. The main international celebrations of the WED 2007 were held in the city of Tromsø, Norway, a city north of the Arctic Circle. The topic for WED 2006 was Deserts and Desertification and the slogan was "Don't desert drylands". The slogan emphasised the importance of protecting drylands. The main international celebrations of the World Environment Day 2006 were held in Algeria. The theme for the 2005 World Environment Day was "Green Cities" and the slogan was "Plan for the Planet! ".